BELLIN -Grundriss des Hafens la Haive an der Kuste von Accadien. N°13. BELLIN, J.N. / ARKSTEE & MERKUS. - Grundriss des Hafens la Haive an der Kuste von Accadien. N°13. Grundriss des Hafens la Haive an der Kuste von Accadien. N°13. - BELLIN, J.N. / ARKSTEE & MERKUS. 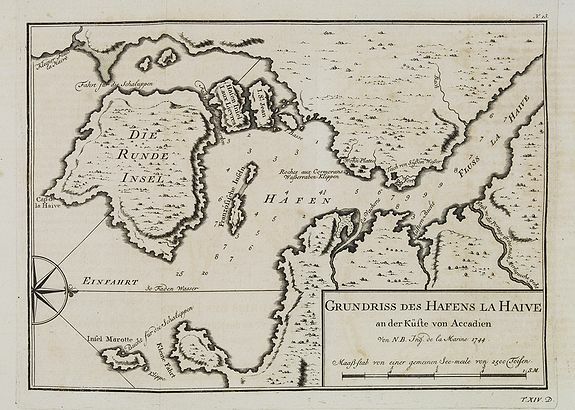 Title : Grundriss des Hafens la Haive an der Kuste von Accadien. N°13.. Size : 7.8 x 11.1 inches. / 19.8 x 28.2 cm. Description :An important early map which focuses on the vicinity of Lahave on the southern coast and locates the Fort Point and the small settlement at the mouth of the Lahave River. The chart is oriented with north to the right.